The Inter-ethnic Forum, the Indigenous Board and the Dioceses’ of Quibdó, Istmina and Apartadó and many NGOs in Colombia, like ABColombia’s partner, the Inter-Church Commission for Justice and Peace (Comision Intereclesial de Justicia y Paz) have raised their concerns about the forced displacement of Indigenous Communities across Chocó. Many communities in Chocó are being forced to displace due to combats between the ELN and neo-paramilitary group the Autodefensas Gaitanistas de Colombia (AGC) . These combats are a part of a fight to control strategic locations for coca cultivation, processing and commercialisation and mechanised small-scale gold mining in areas abandoned by the FARC guerrilla when they moved into the Transitional and Normalisation Zones (TNZ) to disarm. Despite the Early Warning Alerts and the presence of a Joint Task Force TITAN (Navy, Army and Air Force) based in Choco , no effective methods were put in place to help protect the local population and to prevent the displacement. TITAN have a force of over 2,500 troops based in Chocó. These neo-paramilitaries threaten and perpetuate violence against rural communities and their leaders. They confine the movement of communities, are using antipersonnel mines, generating forced displacement all of which is contributing to the humanitarian Crisis in Colombia, and intensifying the situation of poverty and marginalisation of the population of Chocó. 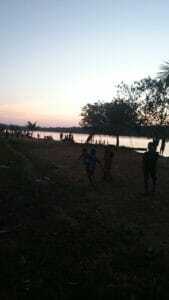 On 24 and 25 March 2017, the Wounaan Indigenous Peoples were caught in the crossfire of an armed confrontation between the ELN and AGC resulting in over 120 families, about 500 people from the Wounaan and Embera Indigenous Communities in Truandó from Join Puur, Kiparadó La Loma resguardo (Reserve) Wounaan and Embera, were forced to flee for their lives to the nearest town of Riosucio to seek refuge. On 21 February, another group of the Wounaan fled from Chagpien Tordó (Litoral San Juan, Chocó). Following the displacement on 24 and 25 March 2017 the UN Refugee Agency (UNHCR) undertook a humanitarian mission in conjunction with the municipal administration of Riosucio, the town Ombudsman and Unidad para las Víctimas. The combined mission of these organisations confirmed the critical situation and the imminent risk of further displacement for local indigenous communities. The UNHCR has called for local, departmental and state entities to work to provide effective humanitarian attention to the affected communities and reiterated its willingness to support the State in doing this. The UNHCR, has also asserted that the humanitarian response to the situation by the State was neither sufficient nor secure. Initiate an inter-institutional and intersectoral working group to formulate a specific plan to and allocate sufficient resources to address the issues of unemployment, education, health and public services in the marginalised region of Choco. Informe de riesgo de inminencia1 N° 009-17, para las comunidades afrodescendientes e indígenas que habitan en la cuenca del río Truandó: los Consejos Comunitarios La Nueva, Clavellino, Dos Bocas, Bocas de Taparal, Truandó Medio y Quiparadó. Así mismo, las personas indígenas habitan en los Resguardos Río Quiparadó, Jagual Chintadó y Peña Blanca del municipio Riosucio, departamento del Chocó.